Discussion in 'General Pokémon Discussion' started by shoz999, Feb 5, 2019. Talk about the antagonists of the Pokemon series from any format and why I say antagonists, I do mean the opposition character to the protagonist which is not always the villain. For example, I'll start with one that's a bit more complicated. One consistency GameFreak has tried to maintain is that all Pokemon aren't really evil and that is kind of true to an extant for Groudon and Kyogre. They really aren't evil as they are following their natural instincts but their actions, consequences and even their behavior do make you certain that they are definitely not good and are definitely not even the victims of the villainous organizations, Team Magma and Team Aqua. If anything, their actions and behavior will make you question GameFreak's attempt to maintain that all Pokemon aren't really evil. Why? 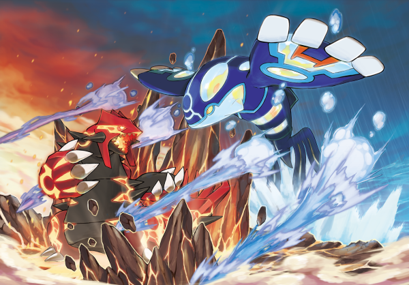 Groudon and Kyogre have a bloodlust for battling each other, this rivalry is in their instinct and they absolutely do not care who gets hurt in the crossfire be it people or Pokemon. They absolutely do not care how much of the world gets destroyed during their battle and this fact horrifies many of the characters of the Pokemon series including Maxie and Archie themselves as seen in the remakes. 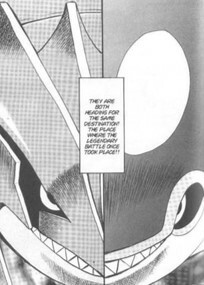 Even worst, it's often implied that Groudon and Kyogre actually want to be awaken by the red and blue orbs in their game and manga appearances. The Pokemon Adventures version is even more terrifying as you literally get to see people and Pokemon screaming, calling for help and running away from tsunamis and earthquakes from different parts of the Hoenn region and the thing is Groudon and Kyogre just don't care. They just give off a slight grin as they see each other for the first time in a long time, ready to duke it out. It's because of just how dangerous their blind rivalry is why Rayquaza is often depicted as a heroic savior to people. It's also why the Elders guard the orbs. They are not necessarily scared of Maxie or Archie taking it away. They are scared of what they are about to unleash on the earth not realizing that they are not the ones in control, Groudon and Kyogre are. "Wow! You didn't even run when the ground started to give under you! I've never seen any Pokemon that took Hitmonchan's Mega Punch in the face yet. You've got mega watts of courage in this small body. Ah, I know! I'll call you Mega!" - Krys holding Chikorita. NovaBrunswick and TokoyamiTheDark like this. NovaBrunswick and shoz999 like this. Hunter J is possibly the closest Pokémon - at least the anime - has gotten to an (attempted) murderer. She doesn't just merely want to get Ash and his friends out of the way so she can carry out her evil aims, but she outright wants to kill him. Nothing will get in the way of trying to steal Pokémon and sell them off for profit - not even her minions, innocent bystanders, or their Pokémon. She only cares about the money. Very few characters in Pokémon are all-out evil - Ghetsis would probably come close to Hunter J, as would Alva from Volcanion & The Mechanical Marvel. Her final appearance in the anime shrouds her ultimate fate in mystery, and we're left wondering if she actually died or not, considering her immorality. I love Canada now and forever. Gearing up for Gen 8 and Sword/Shield! Ghetsis is despicable, but lacks a lot of the on-screen horror of J. I would still argue he's the only core series antagonist to attempt direct murder, compared to the indirect(Lysandre and Cyrus) or unintentional(Archie and Maxie, possibly Sun and Moon Lusamine) destruction other foes threaten. He forcibly uses Kyurem to cause mass devestation which could easily lead to people's death, tries to attack you with Glaciate(which would freeze you, but given what the animation looks like it's easy to believe that this would impale you instead), and all but outright states he intends to kill Lillie in Team Rainbow Rocket if you don't back off. Which, because his team is knocked out, makes him probably the only human antagonist who tries to kill another human being with his bare hands. Ghetsis smiling like a friendly old man after he tells N is nothing more than a puppet. Pokemon Adventures Ghetsis - Easily the most disturbing and cold-hearted villain of the Pokemon series. I don't know about game Ghetsis not having the same horror as Hunter J but the Pokemon Adventures fanbase seem to mostly agree on two noticeable changes that Pokemon Adventures did to game Ghetsis that they believe surpasses the original Ghetsis easily, making him this believable mastermind. It was something I didn't realize before, a very huge flaw in game Ghetsis's progression as a behind-the-scenes villain and that he just immediately appears as the bad guy early on in the games. When Ghetsis first appears in the games, he makes a speech to the public about liberating Pokemon as a seemingly noble figure but that image of a noble figure is quickly shattered when you go to the Dreamyard and find out that Ghetsis is a vile and feared boss among Team Plasma. 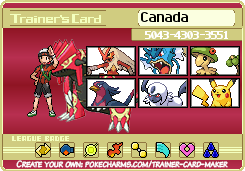 This happens when you beat the first gym. In Pokemon Adventures, Ghetsis is largely the same except two VERY MAJOR changes. He is not revealed as this vile mastermind so early on in the story. In fact he reveals him to be the mastermind near the end of Pokemon Adventurse Black & White. The other major change is what makes him arguably the most horrifying villain of the entire Pokemon franchise is that before and even after it's revealed he's the bad guy is that when he does and says all these horrible things, he does it with a calm smile believing everything he's doing is right. He has the face of a man that says nothing I'm doing is wrong. This Ghetsis does not explode in-anger and lash out as you before attempting to get rid of you. He gets rid of you while calmly smiling, moving on to the next plan. It's funny how a few changes in character can just change so much. NovaBrunswick and BenLee really not taken like this. 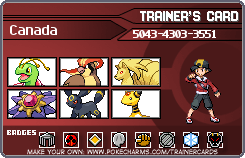 Zinnia is an interesting character with an awesome battle theme. To clarify, Zinnia isn't a villain as she does want to save the world and has considered other people's lives despite how selfish and hypocritical her own plan is but at the same time she does oppose you, the protagonist, and your assortment of friends believing she is the hero of her own story meaning she is the antagonist of the Delta Episode. She actually succeeds sort of. Her plan is basically that once Zinnia becomes Lorekeeper, a person who can summon Rayquaza, she steals a Mega Bracelet, stops the Devon Co. from using their own device to stop the meteor, help Team Aqua or Team Magma, hence why she disguised herself as a member of either group, to revive Kyogre or Groudon to serve as a big enough threat to call Rayquaza despite knowing the horrible consequences and finally summon Rayquaza. She believes this is the best option to stop the meteor with little harm to anyone else as possible but when she summons Rayquaza, to her horror Rayquaza rejects her. For a short moment Zinnia felt like she may have doomed everyone relying on this single plan alone until she realizes she's not the hero of this story. You, the protagonist, are recognized as the hero of this story by Rayquaza himself and Zinnia has a bit of a hard time accepting this but she does and wishes you good luck. 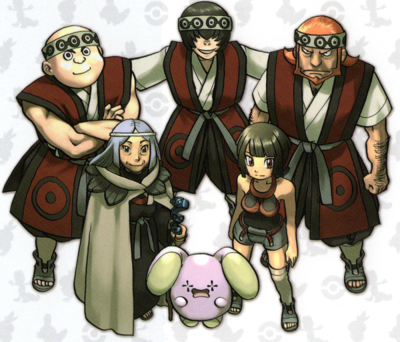 The Draconid Clan. Note how the middle one kind of looks like a Deino and yet has one of the most normal hair-styles of the Pokemon series lol. In the Pokemon Adventures manga, you kind of feel sorry for her despite being selfish at times. Zinnia's story doesn't actually start with her but with another character named Aster, the previous Lorekeeper who is one of Zinnia's best friends whose death brought a lot of tears to Zinnia. To those not aware, Aster is a deceased character that is mentioned in the games as a close friend to Zinnia as well but in the Pokemon Adventures manga, Aster's death has far more emotional weight for Zinnia as she becomes the next Lorekeeper. 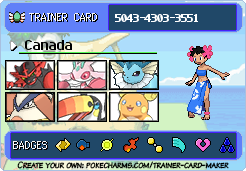 Unfortunately for Zinnia, the majority of the Draconid Clan opposes her as they believe she is nowhere as strong as Aster who actually managed to befriend and ride Rayquaza. So she tries to prove them wrong that she can summon and befriend Rayquaza in order to save everyone but it all goes horribly wrong when Zinnia finally meets Rayquaza. Unlike the games where Zinnia is simply rejected, Rayquaza beats her in anger for her recent selfish actions and she gets a harsh taste of reality that she's not the hero of this story and she's nowhere on the same level as her friend Aster. Even after being nursed back to health, she still has a hard time stomaching the fact that two other people, Ruby (Brendan) and Sapphire (May), aren't even from the Draconid clan but are recognized by Rayquaza in the end. Like the games, she swallows her pride and accepts it, wishing them good luck. 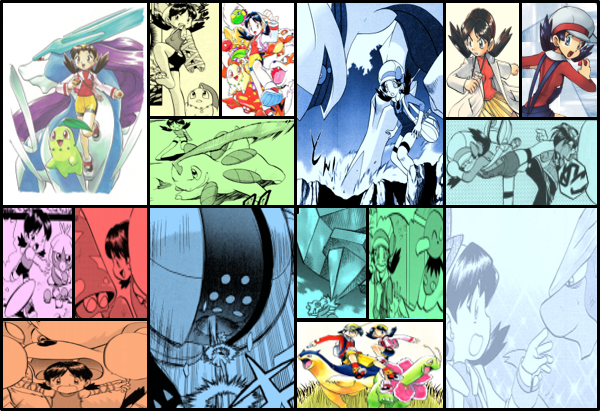 What I like about the Pokemon Adventures manga is that it considers a lot of things that most fans would just skip or ignore at first. For example, Aster was a huge emotional drive for Zinnia in the manga and if you think about it, it's probably the same for the games too as Zinnia does mention her name in her most worrying moments fearing what she might be doing is wrong. A common criticism of Zinnia is that she's selfish when wanting to play the hero and that's actually true but that's also intentionally part of her character. She's the Lorekeeper who inherits the knowledge of knowing how to summon Rayquaza and this knowledge alone makes her believe that she's the only one who truly knows how to stop Rayquaza and because of this, she opposes a lot of people who have different opinions on the situation. She is the antagonist but she's not the villain. She makes some really questionable decisions, like helping revive Kyogre or Groudon but she does this knowing a bigger threat is on the way and when she realizes she's not the one who is going to save the world and someone else is, she swallows her pride and accepts it. She doesn't selfishly kick the protagonist off of Rayquaza, although that would make some funny bloopers, she accepts whom Rayquaza's chosen. The overall opinion of Zinnia seems to be polarized. Not even mixed it seems, polarized. You either love this wild dragon-user or your either annoyed at this selfish hero-wannabe. Regardless I think we can all agree that she's a very interesting character that's part of a bigger piece of lore. What I like about the Pokemon Adventures manga is that it considers a lot of things that most fans would just skip or ignore at first. For example, Aster was a huge emotional drive for Zinnia in the manga and if you think about it, it's probably the same for the games too as Zinnia does mention her name in her most worrying moments fearing what she might be doing is wrong. A common criticism of Zinnia is that she's selfish when wanting to play the hero and that's actually true but that's also intentionally part of her character. She's the Lorekeeper who inherits the knowledge of knowing how to summon Rayquaza and this knowledge alone makes her believe that she's the only one who truly knows how to stop Rayquaza and because of this, she opposes a lot of people who have different opinions on the situation. She is the antagonist but she's not the villain. She makes some really questionable decisions, like helping revive Kyogre or Groudon but she does knowing a bigger threat is on the way and when she realizes she's not the one who is going to save the world and someone else is, she swallows her pride and accepts it. She doesn't selfishly kick the protagonist off of Rayquaza, although that would make some funny bloopers, she accepts whom Rayquaza's chosen. The overall opinion of Zinnia seems to be polarized. Not even mixed it seems, polarized. You either love this wild dragon-user or your either annoyed at this selfish hero-wannabe. Regardless I think we can all agree that she's a very interesting character that's part of a bigger piece of lore. I fully agree with this. She’s, IMO, N done right because she actually does things while also getting people to think with her words. Granted she doesn’t have an abusive father like him to make their stories fully analogous but both are going against the norm to summon a legend to help fix an issue with stubbornness. Also her theme is the best track in ORAS don’t @ me. From the way Zinnia talked about it I honestly thought Aster was her mother lol as she sounded like an older rolemodel that she looked up to.